The What: Altinex will showcase its Anywire video transmission system, which can send 1080p/60Hz HDMI signal over any type of copper wire, including speaker wire, low-voltage wires, any type of Category wires, coaxial wires, and more. The What Else: Anywire facilitates the transmission of live video and computer video signals with synchronized audio over long distances—without the presence of Cat-6 cable. The TP315-101 HDMI over Anywire transmitter can send 1080p HDMI signals over 600 feet using a simple two-conductor cable and the TP315-102 HDMI over Anywire receiver can display it at full HD resolution. The Anywire video transmission system’s unique design provides stable video over any type of video cable. 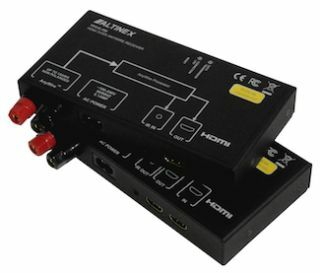 IR pass-through for receiver side to transmitter side control is provided without corrupting the HDMI signal during transmission of IR signals. Operation does not require any user control or interaction. Simply connect the Anywire input and when the receiver detects the transmitter’s signal, the receiver begins video transmission to the display. The Bottom Line: Anywire’s two-wire solution is designed to simplify installation, without the need to cut and splice wires and install expensive connectors or purchase costly cables. Integrators merely route the wires, cut and trim the installation, and connect to the terminals.